‘Tis the season for bundling up! With the cool temps in constant rotation, hitting the streets in a stylishly snug coat is a necessity. Since our outerwear collection naturally becomes the shining star of our ensembles during the chilly weather, we always make it a point to step out with a fashion-forward pick. At Shop With Us, we believe that there is no such thing as having too many toppers in our arsenal and we spied a wool blend wrap coat that will certainly shake up our wardrobe. 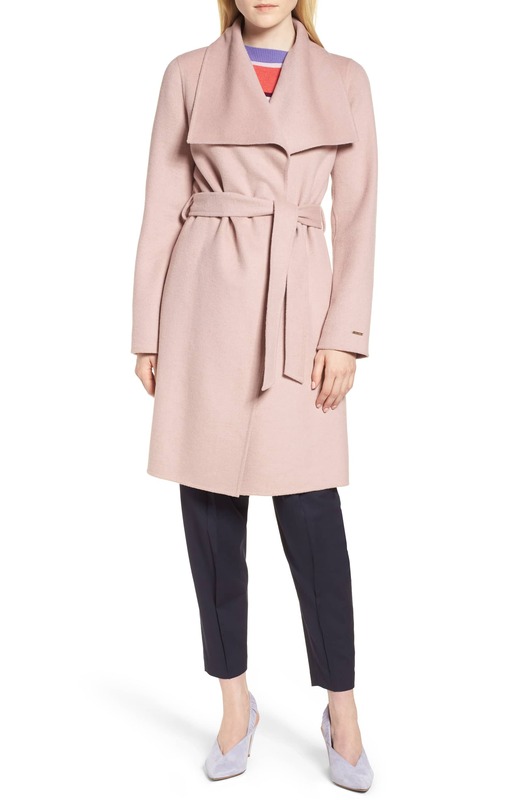 See It: Grab the Tahari Ellie Double Face Wool Blend Wrap Coat at 45 percent off the original price of $268, now $140 in black, powder pink, and sea grey. Also available at Saks Off Fifth for $128 (after an additional 50 percent off with code HOLIDAY). 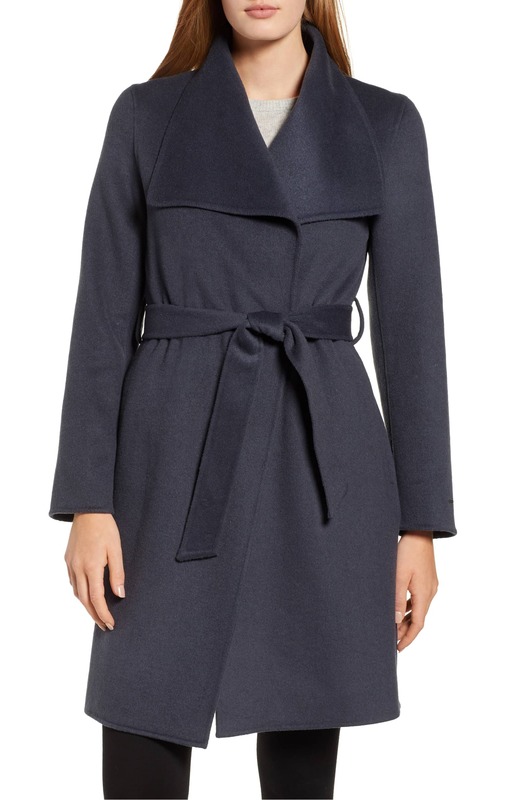 The Tahari Ellie Double Face Wool Blend Wrap Coat is a design that checks all the boxes. Crafted with a super soft wool blend fabric, this garment is the perfect match for our cold weather vault. Blurring the lines between comfort and style, we may actually forget to take off our coats inside, too! Flaunting a gorgeous wing collar, this drapey jacket provides a V-neckline with subtle décolletage for a sassy, yet sophisticated look. The hourglass silhouette is also a major plus for those who love a touch of femininity. The removable belt allows for a customizable fit and we can even wear this overcoat belt-free for a relaxed finish. We can’t stop swooning over its longline construction! Layering is a must-have for the winter and this garment makes it easy to team our favorite cardigan or duster for extra warmth. Fitted in the arms with a loose fit in the body, this cozy find will surely come in major clutch this season. For fashionistas who can’t get enough of a timeless neutral, the black option falls right in line. We can never go wrong with adding this hue to our coat rack as mixing and matching will always be a breeze! We can even keep our look muted and stay true to our love of color with the sea grey pick. On days when we need to give our tried and true overcoat a break, this alternative packs a stylish punch that won’t go unnoticed. Normally retailing for $268, we were stoked to see a 45 percent off markdown, leaving Us with a $140 price tag! Investing in a chic topper usually costs Us a pretty penny, but thanks to this sensational Nordstrom find, we can save a few coins. We live for a good sale! You’ll always catch Us making a bold statement every time we step out and we would love to wear this wool jacket with trousers, mules, a buttondown top, brooch and a tote bag to rule the boardroom in style. For days when we’re running errands, we’re pulling out leggings, over-the-knee boots, an oversized sweater and a shoulder bag to seal the deal. We can even team this design with a bodycon dress, sleek pumps, an embellished clutch, drop earrings and a bold lip to leave our beau swooning. Athleisure flair on the brain? We’re slipping on our favorite lace-up sneakers, skinny jeans, bodysuit and a mini backpack for a winning look. From day to night we can count on this piece to take our style to new heights. 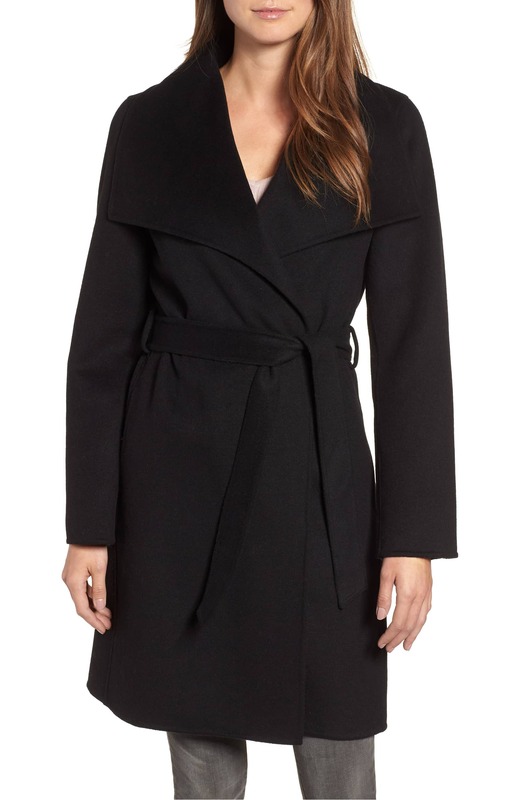 The coat’s super soft and flattering construction makes it a winner with Nordstrom shoppers. Reviewers love the overcoat’s simple lining and color, while others appreciate that it looks amazing on all body types. Shoppers dig that the tie belt cinches the waist, with others singing its praises for its ultimate level of comfort. One reviewer noted that they call this the Olivia Pope coat for its beautiful fit! Many shoppers also like that the build has a lightweight construction that’s perfect for layering without the bulky finish. While most wool jackets can leave Us feeling itchy, many reviewers share that this pick is a refreshing change. One shopper shared if you’re looking for a nice fashionable wrap topper, this is the perfect find. Sizes extra small to extra large are currently available in select shades. Just because the temps are colder than normal, doesn’t mean that we have to sacrifice our style. We never miss an opportunity to upgrade our closets and this is a coat too chic to pass up.